The Craft of Herbal Fermentation Course offers a unique opportunity to take our relationships with plants even further through the art and science of herbal fermentation. Discover the excitement and liberation that comes from creating herbal fermentations including herbal beer, herbal mead, herbal kombucha, herbal water kefir, and herbal lacto-fermented foods through both written instruction and video tutorials. You will also be introduced to exclusive recipes and techniques and supplied with the resource and supply lists that you will need to get started on your own herbal fermentation journey. Seasoned homebrewer, fermented foods enthusiast, or beginner – this course has something to offer everyone. With a specific focus of incorporating herbs into your fermentations, these lessons are loaded with inspiration, new techniques, and considerations specific to the beauty and complexity that healing herbs can bring to any fermentation process. Upgrade your registration with our fermentation tutorial and recipe guides! 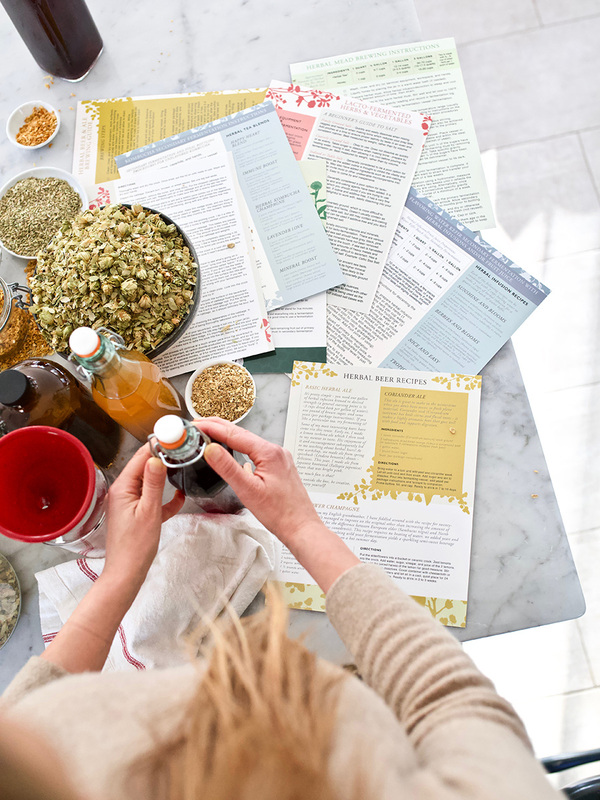 Take these durable, laminated instructions into the kitchen with you while you prepare your herbal ferments to help guide you through the process and inspire you with exclusive recipes! Are you ready? Let’s ferment! Ever wonder what herbs and microorganisms have in common? The simple answer to that question is you. 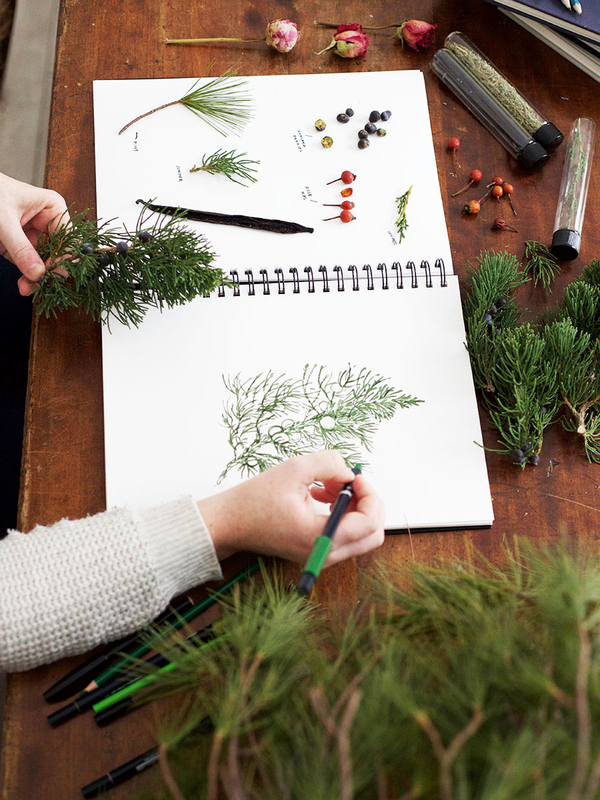 At the Herbal Academy we enjoy supporting our students in their ever-deepening relationships with the plant kingdom and learning how to preserve and capture the healing qualities of herbs is no doubt a part of this process. The Craft of Herbal Fermentation allows you to take this relationship one step further! Our Herbal Academy teachers have come together to provide you with in-depth written discussions and video tutorials about every aspect of herbal fermentation. Whether you are interested in creating delicious beer and mead to share with friends and family or are looking for ways to expand your probiotic routine through kombucha, water kefir, or fermented foods, The Craft of Herbal Fermentation Course will walk you through step by step, from start to bubbly finish. Everything you have ever wanted to know about incorporating herbs into your fermentation journey is now all in one place! Each unit is presented by seasoned fermentation devotees, including: Marc Williams, Ethnobiologist and Executive Director of Plants & Healers International (herbal mead), Tara Welty, L.Ac., Licensed Acupuncturist and herbal beer brewing maven (herbal beer), Erika Galentin, MNIMH, RH, AHG, Clinical Herbalist and Course Development Director at the Herbal Academy (herbal kombucha and water kefir), and Ariel Martian, Herbalist, formulator, and master fermenter (herbal lacto-fermented foods). Upon completing this course you will have all of the information you need to embark upon your own herbal fermentation journey as well as the confidence, enthusiasm, and unyielding curiosity that working with herbal fermentations can inspire. You will have access to one-on-one video demonstrations, as if our teachers are standing in your kitchen! The course provides downloadable written tutorials and resource and supply lists to equip you with all of the tools that you may need for various herbal fermentation experimentations. You will also have access to exclusive recipes and inspiring fermentation stories to support and enliven you along the way. Along with your enrollment, you can choose to upgrade your registration with the beautifully designed fermentation tutorial and recipe guides! Sixteen pages in all, these colorful, botanically decorated guides compile the useful step-by-step instructions for each of the herbal ferments along with several of our favorite recipes. These will become your go-to guides when making herbal fermentations! Useful measuring charts and quick tips are also peppered throughout the pages to act as a helpful reference as you explore the craft of fermentation. Laminated for ease of use and functionality, take these durable guides right into the kitchen with you while you prepare your ferments to help instruct you through the process and inspire you with our exclusive recipes. Use an erasable marker to check off each step as you walk through the recipes! Choose to upgrade your registration with these laminated charts, delivered right to your home! What is an herbal beer made from? What types of herbs can I use? What happens during fermentation to create herbal beer? Are herbal beer gluten free? How long can I keep them before they go ‘off’? What types of bottles should I use for long term storage? Where do I get the supplies I need to start brewing? How do I sterilize my bottles and brewing supplies? What is mead? Is it like wine? How long will it take to brew a batch of herbal mead? How do I use a hydrometer? What type of yeast should I use? How do I know when my mead is ready to bottle and consume? How much alcohol is in herbal mead and does this mean that it is bad for me? What is a racking cane and how do I use it? What are water kefir and kombucha, anyway? What are some of the perceived benefits and cautions to consuming it? What is the difference between using fresh versus dehydrated cultures? What type of sugar can I use, or can I use honey? At what stage of the fermentation processes am I meant to incorporate herbs? What types of beneficial probiotic microorganisms are present? How do I care for these cultures to ensure they stay healthy and vital? How much sugar, alcohol, and caffeine is present in my kombucha? What types of foods and herbs can I lacto-ferment? Can I use herbs on their own to create a lacto-fermentation, like kimchi? What type of fermentation vessel do I need? What are fermentation weights used for? Do I need an airlock? How do I avoid the intrusion of toxic microorganisms that can make me sick? How do I know if something has ‘gone-off’ or is bad and shouldn’t be consumed? You will have the confidence to create your own herbal beer, herbal mead, herbal kombucha, herbal water kefir, and herbal fermented foods using basic, easy-to-come by ingredients and supplies. You will understand how to care for and support the vitality of probiotic fermentation cultures as well as gain an understanding of the benefits and drawbacks to incorporating herbs into probiotic fermentations. You will be able to discern between different types of ingredients required for successful fermentation and how these differences can add special qualities, flavors, or wellness benefits to the process. You will be familiar with the necessary brewing supplies, fermentation vessels, bottling options, and other equipment. You will have an understanding of safety, sanitation, and cleanliness considerations related to brewing herbal ferments. You will have confidence that you are making healthful and safe fermentation products. You will have a firm appreciation for the benefits and cautions of incorporating probiotic fermentations such as kombucha, water kefir, and fermented foods into your daily wellness routine. 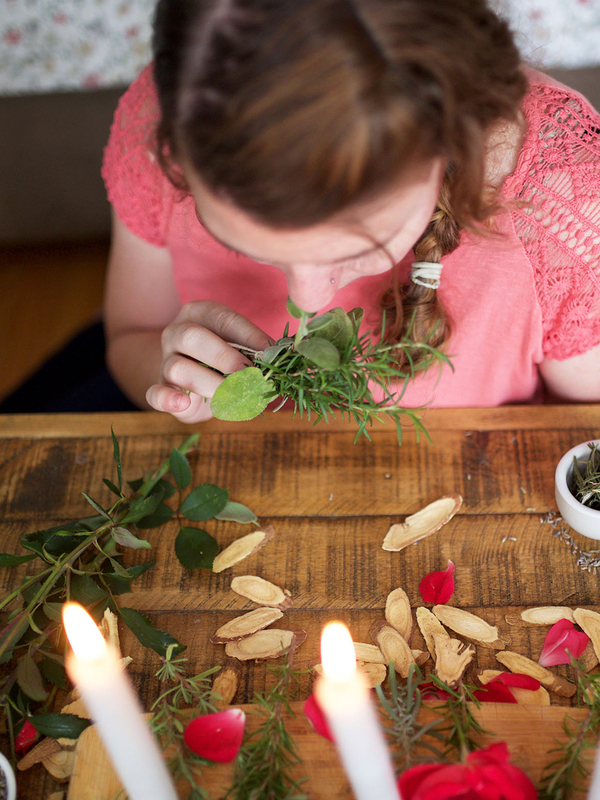 You will be able to appreciate the alchemy and ceremony that herbal fermentation can inspire through discussions on plant spirit medicine, herbal constituent bioavailability, and even creating community through fermentation. 6 month access to the online portion of the program. 4 instructional units including both written and video lessons. Videos with Table of Contents for easy access to on-demand instructions and demonstrations. Download step-by-step instructions for the processes discussed in class. These instructions are also included in the laminated guides should you choose to upgrade at checkout. Choose to upgrade your registration at enrollment to get these guides and recipes laminated for ease of use in the kitchen. An extensive list of resources and supplies to prepare you for fermentation. All lessons are available for download and print for your continued use. Receive a badge in your Student Dashboard with your course completion. Save on your herbs and supplies with exclusive student discounts from Bulk Herb Store and Cultures For Health. In this unit you will learn everything you need to know about brewing herbal beer and ale, from how to make herbal infusions and how to incorporate special yet easy-to-come-by ingredients to how to cap and store your bottles. Academy Educator Tara Welty, L.Ac. brings not only her enthusiasm for mess-making, but provides insight into how herbal beer can capture the essence of plant spirit and be celebrated not solely for their alcohol content, but as tools for building and maintaining sacred relationships with our herbal partners. She explains how brewing herbal beer and ale is a process of both communication and discovery. In this unit you will learn everything you need to know as you embark upon the journey of creating spectacular and meaningful herbal mead. Academy Educator Marc Williams of Plants & Healers International guides us through his step-by-step process, including harvesting wild plant material, incorporating ingredients from all over the globe, the benefits of different types of yeasts, and even how to use a hydrometer for measuring alcohol content. He also gracefully weaves this unit together with his rich philosophies surrounding the ceremony and celebration of herbal fermentation as a means to strengthen community and build cultural topsoil. Every mead you brew and share has the opportunity to tell a wonderful story. 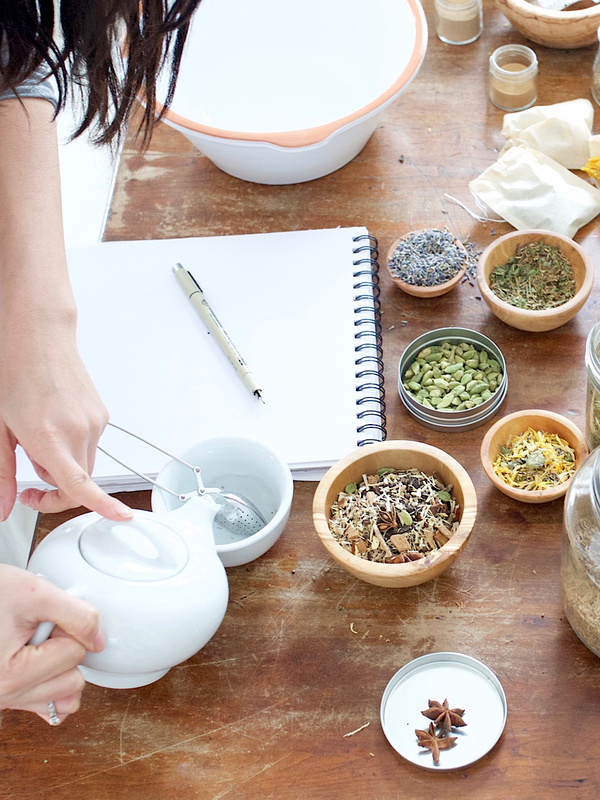 This unit is designed to teach you not only the basics of brewing kombucha and water kefir, but specifically how and when to incorporate healing herbs into the process. Erika Galentin, MNIMH, our Course Development Director, takes students through the basic processes for brewing these two beverages, including how to choose and source your cultures and experiment with various herbs and ingredients at varying stages of the fermentation and bottling processes. She also provides in-depth discussions about the perceived benefits to consuming these beverages and how much residual sugar, alcohol, or caffeine one might expect to be present in the final bottle. In our work with and caring for these special fermentations, herbal kombucha and water kefir can teach us a lot about building and maintaining vital relationships between ourselves and the microbial ecology that is within us and that surrounds us. In this unit you will explore the wonderful world of lacto-fermentation of vegetables and learn how to use herbs for both flavoring and added nutrition. Academy Educator Ariel Martian begins this unit by introducing students to basics of lacto-fermentation through a step-by-step tutorial on sauerkraut as the ‘gateway fermentation’. She teaches us the confidence in knowing that once we learn sauerkraut, with very simple steps and ingredients we can ferment almost anything! She provides us with recipes and tutorials on how to lacto-ferment herbs on their own or incorporated with vegetables. Herbal lacto-fermentation strengthens the bond between food and medicine and provides opportunities for healing and balance through nourishment and nutrition. Come join us in learning the craft of herbal fermentation! Working with herbs in this almost alchemical and ceremonial capacity is all about relationship building, especially when we include the dynamic nature of fermentation cultures and microorganisms, how to care for them, and the transformation that takes place when they are celebrated alongside our beloved herbal partners.